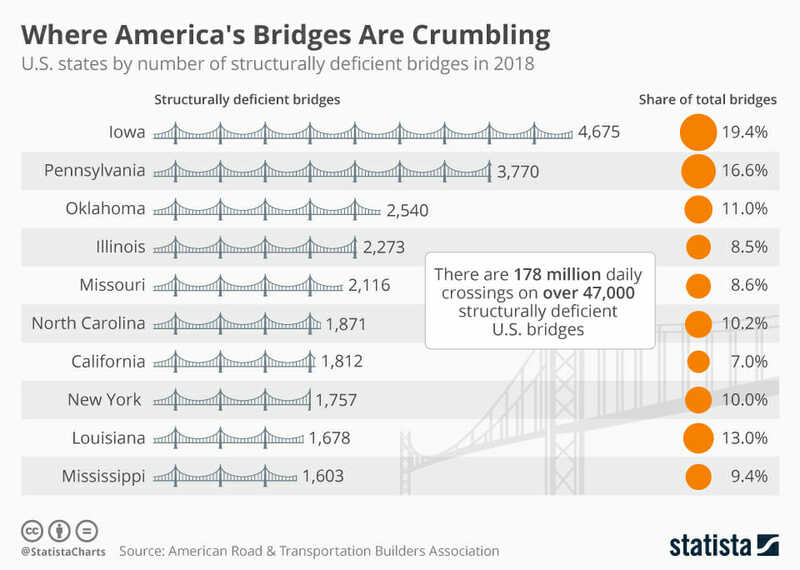 The crumbling infrastructure of the U.S. continues to present a litany of woes: unreliable mass transit; collapsing bridges; exploding tanker cars; leaking pipelines; pockmarked roads and highways. America may be the globe’s biggest economy, but it often resembles a banana republic. The urgent need to fix infrastructure is a headache for government leaders but a huge bonanza for investors who choose the right infrastructure stocks. Below, I pinpoint the five best infrastructure stocks to buy now. It’s not just in America. Deteriorating infrastructure is a global problem, which makes infrastructure spending an investment trend with multi-year momentum. In a recent study, the Global Infrastructure Hub (GIH), a research organization backed by the G20, reported that $97 trillion is required in global infrastructure investment by 2040. The study also found a $18 trillion shortfall between current investment projections and the spending that’s needed. Among the 50 nations studied in the GIH report, the U.S. has the biggest estimated shortfall at $3.8 trillion. That’s the staggering price tag to get America’s bridges, roads, sewer systems and other infrastructure up to standard. The non-partisan group Building America’s Future reports that one third of America’s major roads are in poor or mediocre condition and 45% of major urban highways are congested. The following chart, released by the research firm Statista on April 4, 2019, tells the troubling story. Placed end-to-end, these unreliable and dangerous bridges would stretch nearly 1,100 miles, from Chicago to Houston. The total repair bill (as of 2018 projections) would be $171 billion. U.S. drivers on average cross those bridges 178 million times a day. Stop and think about the human lives at risk… about how your life could be at risk. At the current rate, it would take 80 years to fix all 4,675 of these bridges. However, while Capitol Hill wallows in acrimony and indecision, state and local leaders are rolling up their sleeves and getting the job done. According to the National Organization of State Budget Officers, most governors have successfully pushed through big increases in infrastructure spending for 2019 and beyond, financed by bond issues, toll increases, special taxes and other means. These state leaders haven’t waited for the dithering feds; they’ve been proactive and innovative. The research consultancy Infrastructure USA reports that several states and local jurisdictions are now reconstructing or proposing to reconstruct highways and bridges without the help of federal grants. Another state-level trend is the authorization of public-private partnerships for transportation projects. Publicly traded infrastructure companies are responsible for developing the basic facilities and systems of a country, city or region. These companies are vital for economic development and growth; they build and repair the “backbones” of modern cities. Infrastructure is a single broad term used for all physical systems, including sewage, water, and electrical systems, communications, and transportation. Some infrastructure companies even own entire shipping ports or the very bridges and roads that we drive on. Infrastructure also encompasses waste disposal, educational facilities, and public health delivery. Infrastructure companies are tapped into basic human needs that will always exist, regardless of economic ups and downs or the gyrations of the stock market. As such, they make prudent long-term investments. Read Also: What Are The Best Penny Stocks? Fluor (NYSE: FLR): A construction and engineering colossus that’s well connected to public works departments around the world. Martin Marietta Materials (NYSE: MLM): Leading maker of advanced aggregates that stands to benefit from increased state and local road building. AECOM (NYSE: ACM): Logistical consultant, architect and engineer for a wide variety of infrastructure projects. ABB (NYSE: ABB): Industrial stalwart that offers robotics, power, heavy electrical equipment and automation services. 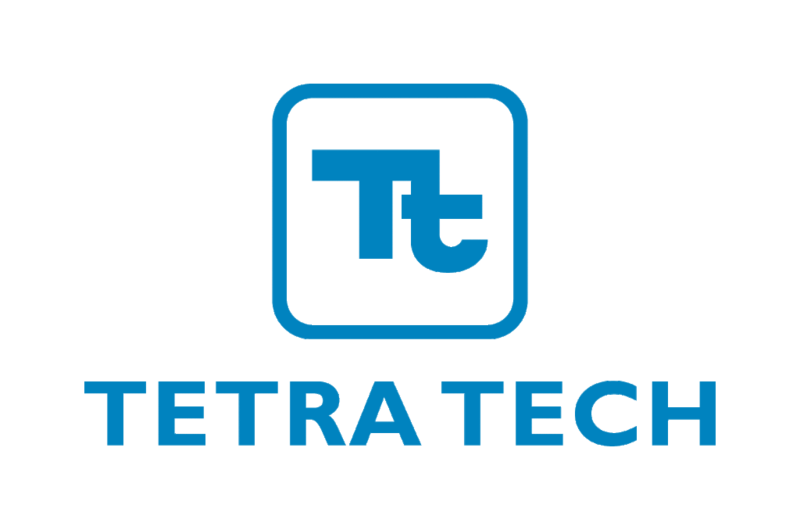 Tetra Tech (NSDQ: TTEK): Specialist in remediation, clean-up and reconstruction in the wake of environmental catastrophes. How Do You Determine What Qualifies As The Top Infrastructure Stock? As with any stock market investment, infrastructure equities worth buying must demonstrate growth in corporate earnings and revenues, combined with reasonable valuations. Infrastructure firms must grapple with the enormous capital costs associated with the building and maintenance of complex structures. Billions of dollars in heavy equipment and a well-paid workforce are on the line, requiring solid balance sheets and plenty of cash on hand. As such, quality infrastructure firms generate some of the steadiest cash flows of any industry. Investors looking for reliable growth and dividend income are well-served by looking into the sector. Each of our five recommendations meet these vital criteria. Let’s examine the infrastructure stocks with the best potential for growth in 2019. With a market cap of $5.4 billion, Texas-based Fluor is the largest and most diversified company in its sector, providing engineering, construction and project management services around the globe. The company operates in five segments: Oil & Gas; Industrial & Infrastructure; Government; Global Services; and Power. Fluor has its fingers in many mammoth transportation projects, with a revenue mix that provides a measure of stability. Fluor also is a major player in nuclear power, which is enjoying resurgence due to concerns over climate change and fossil fuel pollution. Fluor’s forward 12-month price-to-earnings ratio (FPE) of 10.8 is roughly in line with its peers. It’s also a bargain compared to the S&P 500’s FPE of 17.5. The company has ample cash on hand (most recent quarter) of $1.9 billion. The average analyst expectation is that Fluor’s year-over-year earnings growth will reach 74.8% in the current year, 29.5% next year, and 27.2% over the next five years (on an annualized basis). The dividend yield is a healthy 2.18%. North Carolina-based Martin Marietta produces crushed stone, gravel and sand, which are called “aggregates” and are mixed with cement to create concrete for the construction of roadways. The company operates in four segments: Mid-America Group; Southeast Group; West Group; and Specialty Products. With a market cap of $12.6 billion, Martin Marietta also produces chemical additives for ceramics and water treatment, as well as fiber-reinforced polymer products for use in bridge decks, truck trailers, railroad cars and residential construction. Martin Marietta recently spent $1.6 billion in cash to buy Bluegrass Materials, a privately held aggregates company that boasts high-quality reserves of raw materials. MLM’s FPE is a bit pricey at 19 but the modest premium is worth it. Cash on hand totals $44.8 million. The average analyst consensus is that MLM’s year-over-year earnings growth should reach 21.1% in the current year, 17.8% next year, and 14.6% over the next five years on an annualized basis. The dividend yield is 0.93%. California-based AECOM is an acronym for Architecture, Engineering, Consulting, Operations and Maintenance, an apt summary of its many interests. With a market cap of $4.7 billion, AECOM is a global provider of planning, consulting, engineering, architectural, and construction management services for highways, bridges, airports, mass transit systems, government and commercial buildings, water and wastewater facilities, and power transmission. AECOM continues to benefit from a ballot initiative passed November 2016 in its home state of California that calls for a half-cent sales tax increase to plow $120 billion into rail and bus expansions over the next few decades, in addition to street upgrades and pedestrian walkway improvements. The average analyst consensus is for AECOM to rack up year-over-year earnings growth of 2.6% in the current year, 14.9% next year, and 7.7% over the next five years on an annualized basis. The stock’s FPE of 9.7 makes it a bargain. Cash on hand totals $838.3 million. The stock doesn’t currently pay a dividend. With a market cap of $41.7 billion, ABB is a global diversified powerhouse that specializes in emergency construction. A manufacturer of electrical equipment for utilities and industrial customers, ABB operates through five divisions: Power Products; Power Systems; Discrete Automation and Motion; Low Voltage Products; and Process Automation. ABB’s diversification bestows stability during economic downturns, but it’s when the economy is in expansion mode that the company really shines. Management is positioning the company to reap long-term growth from the increasing transfer of manufacturing capabilities to robots. Remote controlled devices and robots are especially useful in hazardous materials clean up, such as contaminated nuclear power plants. ABB generates roughly half of its revenue from late-cycle companies that gain traction during the later stages of economic recovery, such as utilities. So far in 2019, the utility sector has been on a tear, which boosts demand for ABB’s products and services. The average analyst expectation is for ABB to generate year-over-year earnings growth of 13.3% next year and 6.2% over the next five years on an annualized basis. The FPE is 16.5, within the parameters of its industry. Cash on hand totals a whopping $4.1 billion, providing strong financial firepower for further R&D investments. ABB’s dividend yield is a robust 4.29%, making this stock an appealing combination of growth and income. Read Also: What Are The Best Retail Stocks? Global warming poses a bigger threat to the U.S. economy and infrastructure than ever, with escalating risks ahead. That’s the dire warning of the latest National Climate Assessment, a 1,656-page report issued in November 2018 that examines the potential damage from climate change. The scientific report, which comes out every four years as mandated by Congress, was produced by 13 federal agencies and released by the Trump administration. The upshot for investors: Violent climate change will generate massive construction and engineering projects far into the foreseeable future. That’s where Tetra Tech comes in. With a market cap of $3.2 billion, Tetra Tech provides consulting, engineering and technical services for the water, environment, energy, infrastructure, and natural resources sectors. Tetra Tech’s clients include federal, state, and local government agencies in the U.S., as well as commercial and international clients. The company also has a growing presence in the energy sector, for pollution prevention and remediation. California-based Tetra Tech prepares facilities, infrastructure and supply chains for the worst—and comes to the rescue if the worst actually occurs. Tetra Tech has responded to thousands of chemical, biological, radiological, nuclear, and explosive releases, as well as natural calamities such as hurricanes, tornadoes, floods, and earthquakes. The analyst consensus is for TTEK to generate year-over-year earnings growth of 12.1% in the current year, 9.8% next year, and 15% over the next five years on an annualized basis. TTEK offers a small dividend yield of 0.81%. Total cash on hand is $66.5 million. The stock’s FPE is 18.3, roughly in line with its peers. One of the surest ways to make money in the stock market is to pinpoint a company that has tapped into an unstoppable global trend. Few trends are as unstoppable as the devastation of climate change, which unfortunately shows no signs of abating. When the “stuff” hits the fan, government and global leaders turn to Tetra Tech. If you’re looking for long-term growth investments that are resistant to broad market ups and downs, turn to any (or all) of these five infrastructure plays.